Sketch of a D-Day Dress – Platoon Leader: The D-day assault was rigorous and required soldiers to be prepared for an attack that started at sea and ended on land. This drawing by combat historian Lt. Jack Shea, who was attached to the 29th Infantry Division, illustrates that soldiers were well equipped for an amphibious attack. Look closely for several features designed to help soldiers survive in water. Image and caption credit: National Archives. Chart of D-Day Beaches, 04/14/1944. Image and caption credit: National Archives. This order was issued by Gen. Dwight D. Eisenhower to encourage Allied soldiers taking part in the D-day invasion of June 6, 1944. Almost immediately after France fell to the Nazis in 1940, the Allies planned a cross-Channel assault on the German occupying forces, ultimately code-named Operation Overlord. By May 1944, 2,876,000 Allied troops were amassed in southern England. The largest armada in history, made up of more than 4,000 American, British, and Canadian ships, lay in wait, and more that 1,200 planes stood ready. Image and caption credit: National Archives. “’Our landings in the Cherbourg- Havre area have failed to gain a satisfactory foothold and I have withdrawn the troops,’ he wrote. ‘If any blame or fault attaches to the attempt it is mine alone.’ Misdating the paper ‘July 5’— symptomatic of exhaustion and anxiety— he slipped it into his wallet, for use as needed.” Image credit: National Archives. Caption credit: Rick Atkinson, as featured in his book THE GUNS AT LAST LIGHT. Photograph of General Dwight D. Eisenhower Giving the Order of the Day, 06/06/1944. Image and caption credit: National Archives. 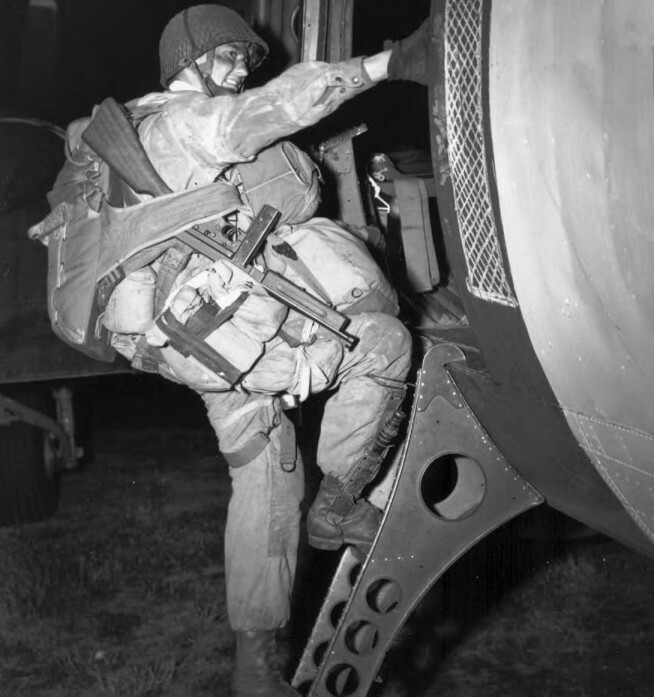 Fully Equipped paratrooper armed with a Thompson submachine gun M1, climbing into a transport plane to go to France as the invasion of Normandy gets under way. At approximately 0200, 6 June 1944, men of two U. S. airborne divisions, as well as elements of a British airborne division, were dropped in vital areas to the rear of German coastal defenses guarding the Normandy beaches from Cherbourg to Caen. By dawn 1,136 heavy bombers of the RAF Bomber Command had dropped 5,853 tons of bombs on selected coastal batteries lining the Bay of the Seine between Cherbourg and Le Havre. Image and caption credit: Center of Military History. U.S. Army. 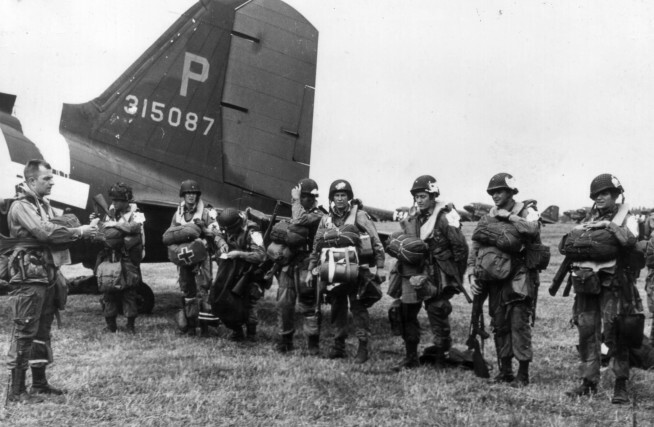 Paratroopers get final instructions before leaving for Normandy. Image and caption credit: U.S. Army Center of Military History. In preparation for the invasion, artillery equipment is loaded aboard LCTS at an English port. Brixham, England. 1 June 1944. Image and caption credit: U.S. Army Center of Military History. American troops load onto landing craft at a port in Britain from where they will shove off for the invasion of Europe on D-Day. Undated – June 1944. Image and caption credit: Center of Military History. View of an LCT with American troops and equipment loaded aboard awaiting the signal for the assault against the continent. England. Undated – June 1944. Image and caption credit: Center of Military History. Gun Crew Alert aboard the cruiser USS Augusta, as landing craft approach the coast of France during the invasion, 6 June 1944. The three landing craft nearest the Augusta are an LCT(6), an LBV, and an LBK. While the Allied air forces were bombing installations along the invasion beaches the Allied sea armada drew in toward the coast, preceded by its flotillas of mine sweepers. Bad weather conditions and high seas had driven the enemy surface patrol craft into their harbors, and the 100-mile movement across the English Channel was unopposed. By 0300 the ships had anchored in the transport areas some thirteen miles off their assigned beaches, and the loading of troops into landing craft and the forming of the assault waves for the dash to the beaches began. At 0550 the heavy naval support squadrons began a 45-minute bombardment which quickly silenced the major coast-defense batteries. Image and caption credit: Center of Military History. Omaha Beach on 6 June 1944. From Grandcamp, cliffs extend eastward to Arromanches-les-Bains with only two breaks, one in the Vierville–Colleville region which was the V Corps area. The Aure River behind OMAHA Beach is a serious obstacle for a distance of ten miles from its mouth, near Isigny. Between the Vire and Orne Rivers the area is covered to a depth of forty miles inland by bocage (land divided into small fields by hedges, banks, and sunken roads). Observation was limited, and vehicle movement was restricted to the roads. The highlands that extend across the invasion front, with a depth up to twenty-five miles, are broken with steep hills and narrow valleys. Although narrow, the roads in this area are generally good. Vital initial objectives were the towns of Carentan, Saint-Lô, Bayeux, and Caen. Image and caption credit: Center of Military History. U.S. Army. A Martin B-26 Medium Bomber flying over one of the invasion beaches, early on D-Day morning. All planes which supported the invasion operations, with the exception of the four-motored bombers, were painted with three white and two black stripes for identification purposes. At dawn on D Day the U. S. Air Forces took up the air attacks and in the half hour before the touchdown of the assault forces (from 0600 to 0630) 1,365 heavy bombers dropped 2,746 tons of high explosives on the shore defenses. This was followed by attacks by medium bombers, light bombers, and fighter bombers. During the 24 hours of 6 June Allied aircraft flew 13,000 sorties, and during the first 8 hours alone dropped 10,000 tons of bombs. Image and caption credit: Center of Military History. U.S. Army. American assault troops in a landing craft huddle behind the protective front of the craft as it nears a beachhead, on the Northern Coast of France. Smoke in the background is Naval gunfire supporting the land. Image and credit: U.S. Army Center of Military History. Assault landing. One of the first waves at Omaha. The Coast Guard caption identifies the unit as Company E, 16th Infantry, 1st Infantry Division. Image and caption credit: U.S. Army Center of Military History. U.S. Troops land at Normandy, D-Day, June 6, 1944. Credit: Library of Congress. An enemy shell hits the beach where U. S. troops are advancing. Image and caption credit: Center of Military History, U.S. Army. Assault troops landing on Utah Beach on D-Day. Image and caption credit: Center of Military History. U.S. Army. Men and equipment along UTAH Beach on D Day (bottom). The mission of VII Corps was to assault UTAH Beach on 6 June 1944 at H Hour. 0630, and to capture Cherbourg with a minimum delay. The troops, landing just west of the Vire estuary, encountered less opposition than any other Allied forces on D Day. Image and caption credit: Center of Military History. U.S. Army. Army medics administering blood plasma to a survivor of a sunken landing craft on omaha Beach. D-Day casualties for the V Corps were in the neighborhood of 3,000 killed, wounded, and missing. The two assaulting regimental combat teams lost about 1,000 men each. The highest proportionate losses were taken by units that landed in the first few hours, including engineers, tank troops, and artillerymen. The D-Day casualties of V Corps were much higher than those suffered by VII Corps, where the assaulting seaborne division lost 197 men, including 60 lost at sea. Image and caption credit: Center of Military History. U.S. Army. The beachhead is secure, but the price was high. A Coast Guard Combat Photographer came upon this monument to a dead American soldier somewhere on the shell-blasted shore of Normandy., ca. 06/1944. Credit: National Archives. Invasion. Carrying a full equipment, American assault troops move onto Utah Beach on the norther coast of France. Landing craft, in the background, jams the harbor. 6 June 1944. Image and caption: U.S. Army Center of Military History. Troops leaving an LCVP to wade ashore. Half-tracks and 21/2-ton amphibian trucks can be seen on the beach, and in the background men marching in columns start southward toward the bluffs. On the shelf the enemy strung barbed wire and planted mines. Lanes had to be cleared through these obstacles before the infantry could advance. Beyond this strip containing obstacles, the enemy laid out firing positions to cover the tidal flat and the beach with direct fire, both plunging and grazing, from all types of weapons. The men landing were fired upon from these positions, which for the most part had escaped destruction during the prelanding bombardment. Image and caption credit: Center of Military History. U.S. Army. Members of an American landing party lend helping hands to other members of their organization whose landing craft was sunk by enemy action off the coast of France. These survivors reached Omaha Beach, by using a life raft. Image and caption credit: U.S. Army Center of Military History. This graphic tells the story of how the France beachhead was supplied on “D-Day”. 6 June 1944. Image and caption credit: U.S. Army Center of Military History. American assault troops of the 16th Infantry Regiment, injured while storming Omaha Beach, wait by the Chalk Cliffs for evacuation to a field hospital for further medical treatment. Collville-sur-Mer, Normandy, France., 06/06/1944. Credit: National Archives. U.S. Soldiers of the 8th Infantry Regiment, 4th Infantry Division, move out over the seawall on “Utah” Beach, after coming ashore. Other troops are resting behind the concrete wall. Photo dated 9 June 1944, but probably taken on “D-Day”, 6 June 1944. Image and caption: Naval History and Heritage Command. Message from Gen. Dwight D. Eisenhower to Gen. George C. Marshall about the Invasion of Normandy on D-day, June 6, 1944. Image and caption credit: National Archives. Page 1, Franklin D. Roosevelt D-Day Prayer, 06/06/1944. Image and caption credit: National Archives. Page 2, Franklin D. Roosevelt D-Day Prayer, 06/06/1944. Image and caption credit: National Archives. Page 3, Franklin D. Roosevelt D-Day Prayer, 06/06/1944. Image and caption credit: National Archives. Photo taken on D+2, after relief forces reached the Rangers at Point Du Hoe. The American flag had been spread out to stop fire of friendly tanks coming from inland. Some German prisoners are being moved in after capture by the relieving forces. Image and caption credit: U.S. Army Center of Military history. General Mcauliffe Unveiling the German Surrender Documents in the Rotunda of the National Archives, June 6, 1945. Credit: National Archives. President Reagan giving a speech on the 40th Anniversary of D-Day at Pointe du Hoc, Normandy, France, 06/06/1984. Credit: National Archives. In the church of St Mere Eglise, France (FRA), this stained glass window shows the arrival of the US Army (USA) 82nd Airborne paratroopers as they were dropped over the town on D-Day, June 6, 1944: 06/04/2004. Image and caption credit: National Archives. A sand sculpture of troops disembarking from a landing craft during the June 6, 1944, D-Day invasion of the beaches of Normandy, France. Photo by Bernard Clerc-Renaud, June 29, 2004. Caption: DoD. World War II veterans sign autographs after a commemoration ceremony at Angoville au Plain, France, June 4. The ceremony honors two medics from the 101st Airborne Division who rendered aid to 80 combatants and a local child in 1944 during the war. This ceremony is one of many in honor the 67th anniversary of the Normandy invasion. Credit: Staff Sgt. Tramel Garrett. Spectators watch as U.S. Army Airborne soldiers from various unit throughout Europe and Italy, including the 21st Theater Sustainment Command’s 5th Quartermaster Detachment, march through the Graignes Cemetery after a memorial ceremony in Graignes, France, June 4. The ceremony was held to honor the U.S. soldiers and citizens of Graignes who gave their lives in defense of the town during the period of June 6-12, 1944. During the ceremony 10 wreathes were laid by various city officials, veterans and U.S. Army soldiers. This ceremony was one of many World War II commemoration ceremonies held this year to honor the soldiers who fought during the invasion of Normandy, France, in 1944. Credit: Staff Sgt. Michael Taylor, DVIDSHUB. A general of the French Army lays down a wreath in front of the 101st Airborne Division memorial here during a commemoration ceremony June 3. The city of Carentan pays tribute to the 101st every year for liberating the city during World War II. Hundreds of Carentan citizens were on site to watch the ceremony as various military personnel from the United States, Germany, France and England laid wreaths near the memorial in honor of the brave soldiers who fought to free the city. Following the ceremony, all the military ceremonial personnel marched through the city and convened at the town hall where they socialized with the local citizens. The ceremony is one of many that honor the 67th anniversary of the Normandy invasion. Credit: Staff Sgt. Michael Taylor, DVIDSHUB. Task Force 68, which is made up of paratroopers from U.S., Germany, France, Holland, and United Kingdom, re-enacted the D-Day airborne operation on the La Fiere fields near Ste. Mere Eglise, France to commemorate the heroic acts of the WWII paratroopers who made the jump 68 years ago. After the jump, the task force marched into the town of Ste. Mere Eglise to the sounds of cheers from the locals. Task Force 68 is in Normandy, France to commemorate the 68th anniversary of D-Day. Image credit: Staff Sgt. Sharilyn Wells. Caption credit: DVIDSHUB. Second to right to left: Dorothy and Ellen Levitsky, World War II veterans, salute during the national anthem at a plaque dedication for them, June 4. Task Force 68, which is made up of paratroopers from across the U.S. Army, Air Force and the Parachute Regiment’s 4th Battalion from London, England, attended a plaque dedication ceremony for Dorothy and Ellen Levitsky, sisters and WWII nurses who were located at a hospital in Bolleville, France, June 4. The Levitsky’s were made honorary Bolleville citizens in the dedication ceremony. “We thank you for all of this, but really, we were just doing what we were told to do our jobs,” said Ellen, 92 years old. Dorothy is 95 years old. Task Force 68 is in Normandy, France to commemorate the 68th anniversary of D-Day. Image: Staff Sgt. Sharilyn Wells. Caption: DVIDSHUB. On this day, 69 years ago, Currahee soldiers participated in Operation Overlord, the invasion of Normandy, France. From Operation Market Garden and The Battle of the Bulge to the capture of Adolf Hitler’s Berchtesgaden, the original “Band of Brothers” paved the way for future Currahees and set the standard for combat excellence. U.S. Army Brig. Gen. Clarence K. Chinn, deputy commanding general for Afghan development south of Kabul, 101st Airborne Division (Air Assault), Combined Joint Task Force 101, presents Spc. Thaddeus Ivory, a Huber Heights, Ohio, native and wheeled vehicle mechanic with 4th Battalion, 320th Field Artillery Regiment, 4th Brigade Combat Team, 101st Airborne Division (Air Assault), with the 101st Airborne Division combat patch during a patching ceremony for the Currahee Soldiers at Forward Operating Base Lightning June 6, 2013. Image credit: Spc. Ryan Scott, 129th Mobile Public Affairs Detachment. Caption credit: DVIDSHUB.